Like much of the east, Williamsburg, VA suffered through record a record heat wave last week, with temperatures in the upper nineties and humidity to match. 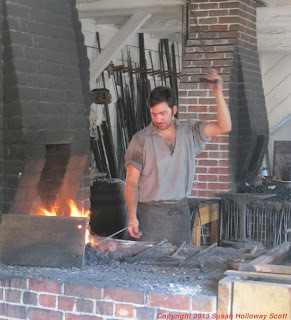 Yet Tidewater Virginia was a hot place in the 18th c., too, and the interpreters and historic tradespeople of Colonial Williamsburg were determined to continue on as they would have 250 years ago. The single most important secret weapon against the heat: linen, the best possible fiber for keeping cool(er). As always, click on the images to enlarge them. Some people I've identified, but there are others, alas, whose names I didn't get. If you know the anonymous ones, please let me know & I'll happily add their names. 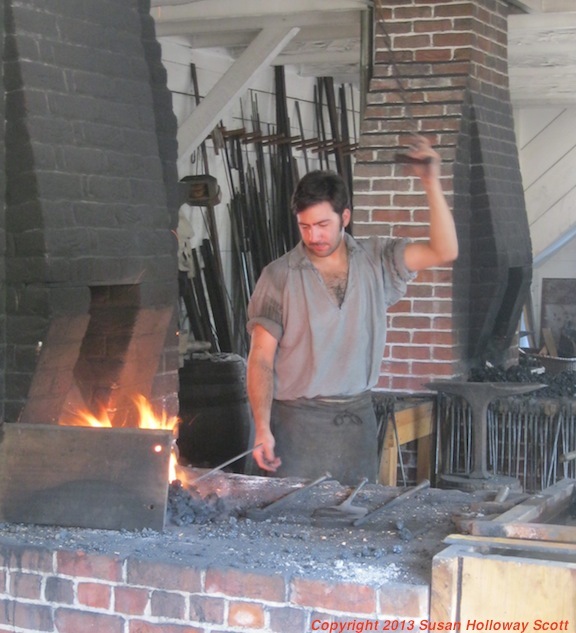 Journeyman blacksmith Christopher Henkels, top left, swore that the heat of the summer sun was much worse than standing near his fire to work. I'll take his word for that - but he was dressed for the heat with the neck of his line shirt open and the sleeves rolled as high as possible. 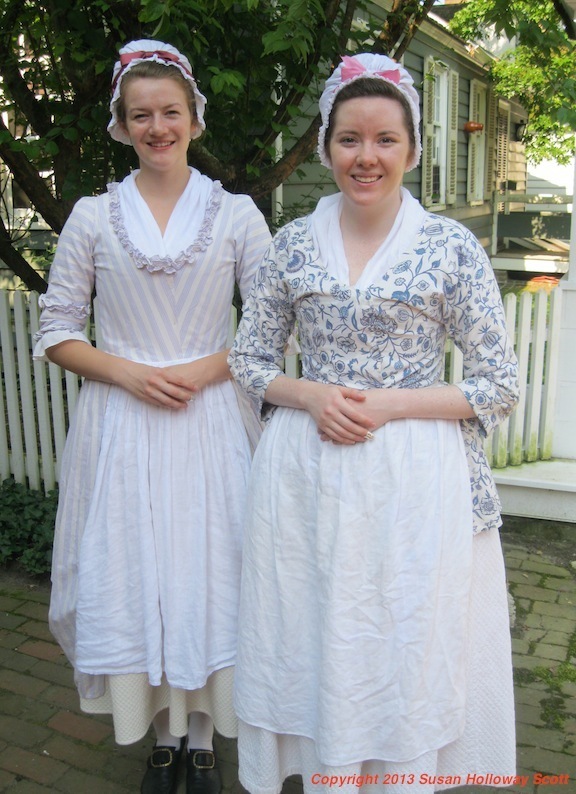 These two summer interns, right, in the Margaret Hunter millinery shop are ready to ply their trade in crisp linen and cotton, with silver thimbles on their fingers. Lauren Greene, left, wears a purple and white striped cotton English gown, with a diamond-patterned cotton petticoat, linen cap, apron, and neckerchief. 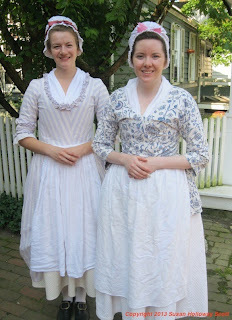 Molly McPherson, right, also wears a linen apron and cap with her short gown of printed cotton, and a cotton neckerchief. Melissa Blank, lower left, is an apprentice cook in the Governor's Palace kitchen. Open-hearth cooking is hot work, but the royal governor expected a fine midday dinner to impress his guests, regardless of the weather. 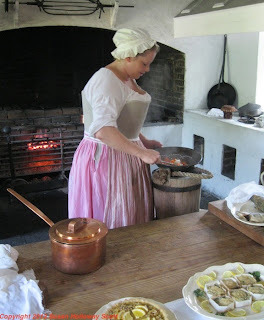 Melissa is dressed the way most 18th c. working women would met the challenge of the heat: she's wearing her linen stays over her linen shift, with a linen petticoat and cap. In addition to being cool, linen has natural fire-retardant properties (if a spark lands on linen, it smolders rather than bursting into flame, or worse, melting onto the skin like modern petroleum-based fibers) that make it the perfect fiber for working around a fire. But in the 18th c., just as now, there are plenty of people who resolutely ignored the heat, and dress exactly as they would for any other day. These three men, lower right, were on their way to a program at the Governor's Palace; my guess is that they represent a wealthy gentleman (perhaps even the royal governor himself) in silk coat, waistcoat, and breeches; his secretary in somber dark green; and his enslaved servant in silver-laced livery that's probably wool. Their black hats are either wool, or beaver - hardly summer-weight! - and the two gentlemen area also wearing full wigs. The saving grace would have been the long linen shirts that all three were wearing next to the skin beneath all that stylish magnificence. Thank you for another Williamsburg posting and photos. I enjoy each and every one!